On Feb. 26/16, Dr. Dhalla hosted a reception for about 100 colleagues and friends of Ivan. Click here to listen to the formal proceedings. Click here to view photos taken by Keith Levit. “Can Aspirin prevent heart attacks without causing more harm than good? Dr. Arnold Naimark ( R ) introduced Dr. Cairns. Both were effusive in their praise of Levit family for their leadership in funding IACS efforts to educate Manitobans about Heart Health. 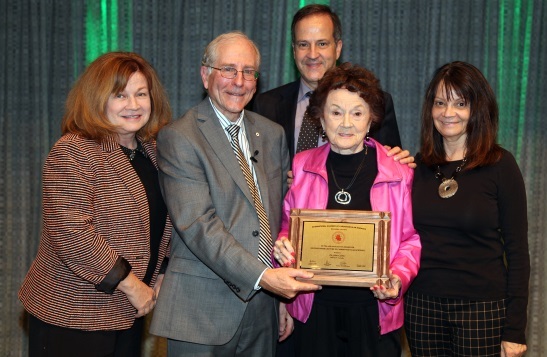 Dr. Cairns proudly shared his gratitude for the support with Yetta Levit surrounded by her children - Diane (L), Keith and Shelley. Not only did nearly 300 Luncheon-goers enjoy the awesome talk which they expected from Dr. Noel Bairey Merz but they were also treated to a heart-healthy lunch created by Chef Quetin Harty of the RBC Convention Centre Winnipeg with help from Ilona Beck of CanMor Grain Products who provided the recipe and supplied flax for cooking and SHAPE Foods who supplied flax oil. 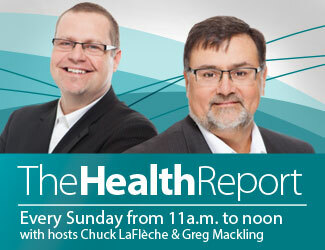 Dr. Bairey Merz shown hosting to aggressive promoters of Heart Health. Pres. 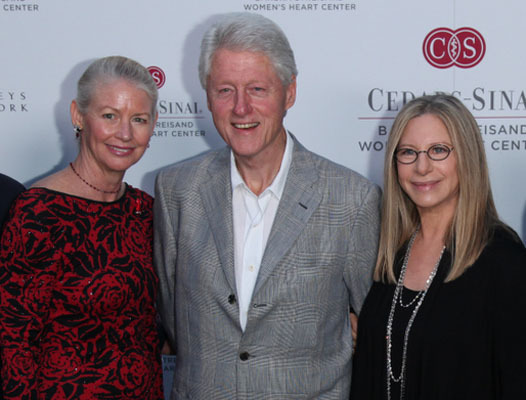 Clinton discovered the hard way that he need life-saving surgeries to redirect his lifestyle. Barbra Streisand has identified the dreadful gap in heart care for women and introduced Dr. Bairey Merz for an incredible talk on TED.com. Click here to learn from these amazing ladies. 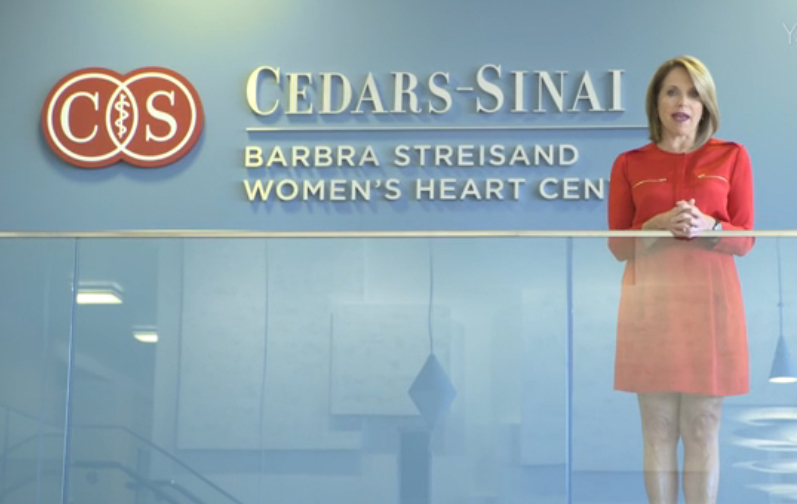 WATCH KATIE COURIC CHECK HER HEART! 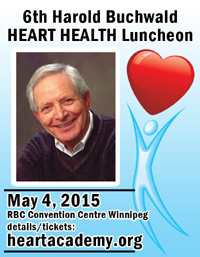 On Sunday, April 26, 2015, on CJOB's "The Health Report"
On May 4/15 Terry MacLeod again served as the Luncheon's extraordinary Host. Please click to learn more about Terry. On his Weekend Morning Show" on Mar. 22/15 on CBC Manitoba, Terry MacLeod interviewed Dr. Suzy Santos on Women's Heart Health - click here to listen ! On March 29th, Terry interviewed Yvone Baert - click here for her sharing her experience which was happily solved with seven stents. 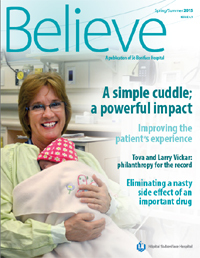 On Jan. 9th, Terry interviewed Teri Moffat and Dr. Todd Duhamel. 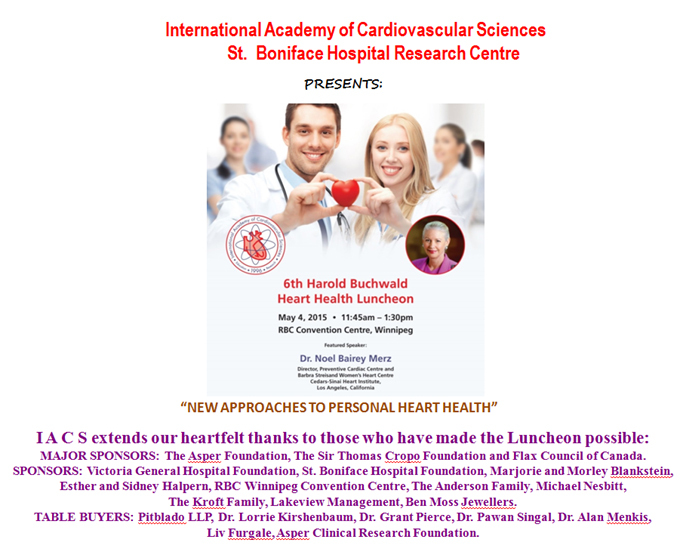 They are leading the HAPPY Hearts Project at St. Boniface Research based on the work of IACS Fellow Jay Cohn about which Dr. Cohn spoke as the Buchwald Lecturer on Sept. 29/09- CLICK HERE to listen to Terry's extraordinary interview. Dr. Naranjan S. Dhalla, Distinguished Professor of Physiology, University of Manitoba, and Director of Cardiovascular Developments, St-Boniface Hospital Research was honored at the 2nd European Section Meeting of the International Academy of Cardiovascular Sciences, held October 8-10, 2015 at the Hotel Crowne Plaza in Belgrade, Serbia. 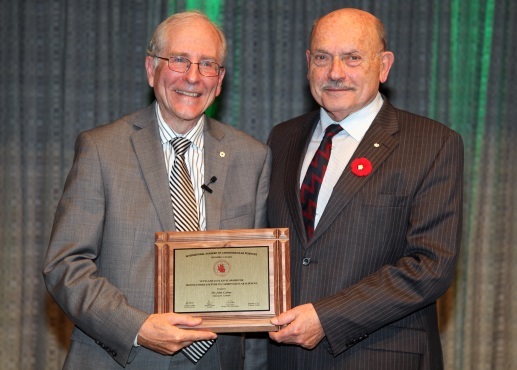 Dhalla was presented with a plaque of appreciation for establishing the International Academy of Cardiovascular Sciences, as well as a video featuring well-wishes from top researchers in the European cardiovascular research community, including Dr. Andras Varro (Hungary), Dr. Jan Slezak (Slovakia), Dr. Danina Muntean (Romania), Dr. Dragan Djuric (Serbia), Dr. Vladimir Jakovljevic (Serbia), Dr. Bohuslav Ostadal (Czech Republic), and Dr. Tatiana Ravingerova (Slovakia). Please click here to enjoy this superb tribute to Dr. Dhalla. 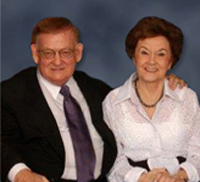 On Sept. 6/14, Dr. Bohuslav Ošťádal, from Prague, Czech Republic assumed the Presidency of I A C S for a three-year term. 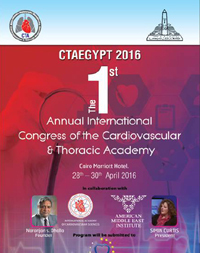 Sharon L. Mulvagh is Professor of Medicine,Mayo College of Medicine, and Consultant in Cardiovascular Diseases at Mayo Clinic, Rochester, MN. Click to listen.